This was not really supposed to be a storm chase, just a return trip from a high school class reunion in Waterloo, IA to Edwardsville, IL - but it sure did get interesting. Already around 1:30 when my fiancee Alice and I left Waterloo, there were powerful storms just to the west. We detoured west about 3 miles from our starting point at Hwy 20 and Dysart Road, to the next exit west, to get a look at the approaching storm, which had a line of heavy precip moving into the city, with a ragged rain-free base to the south. But as the gust front and rain quickly moved over us, we started back to the east and were on our way. A few minutes later, a severe T-storm warning went up for Blackhawk County, as the storm dropped 3/4 inch hail on Hudson, IA. But we gradually got ahead of the storms, which were moving east and building southward, as we headed southeast on I-280 then east on I-80. Between Iowa City and Davenport, I noticed 2 or 3 towering cumulus to our north that had what looked like small wall clouds under the updraft, and as we outran them, they seemed to be glaciating. But I didn't give them a lot of thought. Around 4:00, we stopped at the Iowa welcome center at LeClaire. 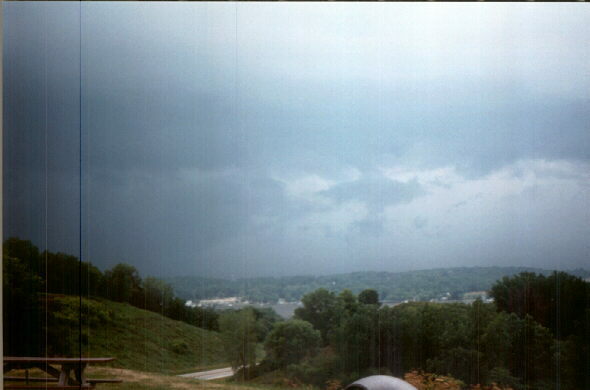 When we got back in our car to head onward, I noticed explosive towers going up just to the west, and the radio quickly announced a tornado warning for Scott County, where we were. While were were in the welcome center, 2 other tornado warnings had also gone up, one further west in Cedar County and another to the north for the Clinton area. All 3 were based on doppler-indicated tornadoes. We decided to cross the river and park at the Illinois welcome center, which is on a high overlook facing west at the top of the bluffs. One storm passed north of us, displaying a wall cloud at times but no funnels or rotation that we could see. Two more came behind it, one to the northwest with what first looked like a large wall cloud but may have been scud as it became totally detached from the parent cloud. To the southwest was an intensifying precipitation core with lots of outflow clouds, which spread over us with strong outflow gusts. Around this time a chaser who identified himself as being from Chicago pulled up next to us and set up a tripod. Didn't get the name; if you are reading this, drop me a note! As it soon looked like the whole thing was going outflow dominant, we decided to head on - looked like a new lowering way off to the south on the tail end, but we couldn't see it well. But we thought we might catch up to it as we headed south. By now, there were T-storm warnings for Rock Island County. As we looped around toward the south on the east side of the quad cities, we saw a large, wide area of generalized blowing dust along the gust front, which was now several miles ahead of us. Leaves and a few small branches flew across the road from the strong westerly outflow. Then things got VERY interesting. I am not sure of the exact time, but I think it was around 5:10 or 5:15 - in any case just after we heard a severe T-storm warning for Henry County. Suddenly, a rather intense dust swirl went up very near - probably just southeast of - the intersection of I-80, I-74, and I-280 at the southeast edge of the quad cities, which we were approaching from the north, about a mile away. I hollered "gustnado!" but a moment later, Alice said "swirling clouds!" Right above the dust swirl, which grew rapidly, there was clear cyclonic rotation in the clouds! Because there was rotation both in the clouds and on the ground, I would classify this as a weak gust front tornado, not simply a gustnado. (If this is not the correct classification, please let me know!) Both the dust on the ground and the cloud rotation above it continued for about 4 or 5 minutes. We were headed south and pulled over about a mile before the interchange; the dust swirl and rotating cloud appeared to be just to the left of I-74 as 74 continues southward on the other side of I-80. The apparent tornado moved very little, or possibly it was moving away from us toward the south-southeast. After about four or five minutes the dust disappeared and we could no longer see rotation in the clouds. As we continued south, we saw two more features similar to this but much smaller and shorter-lived. In both cases, we saw dust swirls on the ground and swirling clouds above, though the last one appeared to be rotating anti-cyclonically. But these latter two, which occurred a few miles further south, did not last nearly as long nor were they nearly as large. In this series of photos, the rotation in the clouds above the dust swirl can clearly be seen. 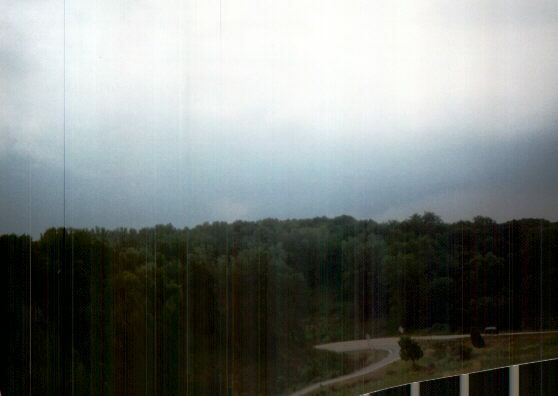 In the first photo, a gap can be seen between the lowest cloud tag in the front (from our view) of the area of rotation, which was moving to the right, and the lowest cloud tag in the back, which was moving to the left. In the second photo, the cloud tag in front has closed the gap and is moving in front of the cloud tag in the back. We also observed dust blowing to the left, away from us, and to the right under the rotating clouds. In the third photo, the lowest cloud tag in the front is now to the right of the lowest cloud tag in the back. 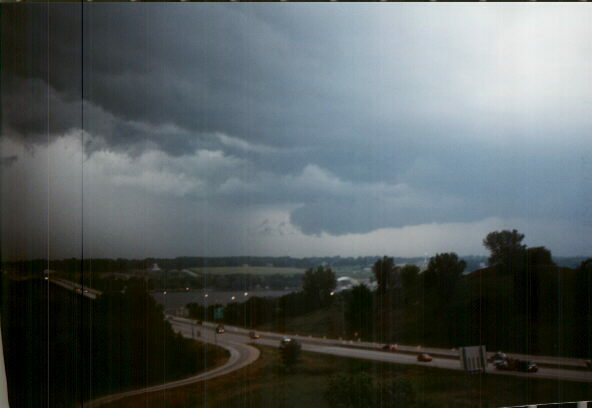 All three of these photos were taken looking south from just north of the I-80/I-280/I-74 interchange. By the way, I was amazed at the number of people who just drove on, even though the dust swirl was just a few hundred feet (at most) east of the freeway. A few stopped, but the majority did not. Fortunately the swirl remained in an open field and did not cross either I-74 or I-80.